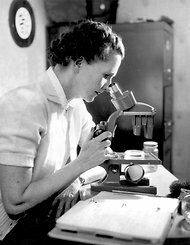 How Rachel Carson Spurred Chemical Concerns by Highlighting Uncertainty | "Global Possibilities"
United Press InternationalRachel Carson testifies before a Senate subcommittee studying pesticides, June 1963. Rachel Carson‘s work and legacy are being actively assessed at the moment, given that her landmark book, “Silent Spring ,” was published 50 years ago this week. A good starting point is “How ‘Silent Spring’ Ignited the Environmental Movement,” a fascinating feature by Eliza Griswold in last Sunday’s New York Times Magazine. And of course there’s “On a Farther Shore: The Life and Legacy of Rachel Carson,” the new book by William Souder (I’m reading it now; here’s the Times review). If you’re in the Boston area, I’ll be on a panel at Harvard University later today with the author and climate campaigner Bill McKibben and Frances Beinecke, the president of the Natural Resources Defense Council, to discuss the book in the broader context of science and environmental advocacy. But of all the fresh considerations of Carson’s work, there’s one that stands out for me at the moment — a recent paper by two researchers of rhetoric and writing who dug in on “Silent Spring” drafts, notes and revisions and found that Carson had a remarkable and rare trait for someone so committed to raising public concern about a pressing environmental issue. Rather than downplay scientific uncertainty and gaps in understanding, she progressively amplified what was unclear about the human impacts of DDT and other synthetic compounds on humans and wildlife. The authors, Kenny Walker, a doctoral candidate at the University of Arizona, and Lynda Walsh, an assistant professor of English at the University of Nevada, Reno, describe how surprised they were by this pattern, given a large body of work, including “Merchants of Doubt,” the book by Naomi Oreskes and Erik Conway, showing that inflating uncertainty has mainly been the task of industry-backed efforts to blunt public concern and policy. This stands in stark contrast to the “Be Worried” approach that some have tried (in vain) on global warming over the years. Mind you, Carson’s book has plenty of passages, from beginning to end, warning powerfully of the “grim specter” of a poisoned future. The 50th year anniversary of “Silent Spring” invites reflection not just on the book, but on how we have paid attention to it for half a century. We tend to celebrate “Silent Spring” from the moment of publication forward, and this tendency ignores the rich history before publication—the five-year long process of meticulous research, writing, and rewriting. We tend to forget that “Silent Spring” did not just arise from Rachel Carson’s head fully formed. It was part of an ongoing conversation about the uncertainties of life in the postwar period. If we focus on the process behind “Silent Spring,” and not just the product, what lessons might we learn about the strategies Carson used to enter the conversation and frame the scientific debate around toxic chemicals? Brooks Studio, from the Rachel Carson Council. In a study published last January, Dr. Lynda Walsh, an associate professor of English at the University of Nevada, Reno, and I sought to answer this question by researching Carson’s composing process, with a particular focus on the crucial topic of uncertainty. We defined uncertainty as both ignorance (we do not know) and risk (a probability distribution of likely outcomes), and identified 33 places in “Silent Spring” where Carson expressed uncertainty. I then went to the Carson Papers archive at the Beinecke Library at Yale University to examine her sources, and her drafting process at these 33 locations. What I found was that not only did Carson underline, circle, and annotate her sources with particular attention to uncertainty, she amplified its use in later drafts. Sitting there at the archives, I witnessed where and when Carson crossed out entire sections, and inserted expressions of ignorance and risk in order to frame her carefully selected case studies. In our paper we argued that Carson adapted and adopted uncertainty from her sources and deliberately used it to provide a site for public participation in scientific debates. Carson’s choice to deliberately increase her use of uncertainty in “Silent Spring” came as a bit of surprise since in the well documented cases of tobacco, acid rain, and global warming, it was the skeptic’s strategy to amplify doubt, not the scientist’s. In Carson we saw a counter-example: her composing process suggested that uncertainty is a crucial site for public participation and precautionary action. Uncertainty’s ability to disrupt knowledge (“we don’t know”) and actualize risk (“potential for harm”) gave the public a place to draw their own inferences, make their own evaluations, assert their right to know the potential hazards they face, and to motivate policy action. 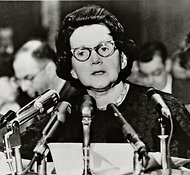 Uncertainty provided the readers of “Silent Spring” a clearly defined role in an otherwise inaccessible scientific controversy. Uncertainty shaped the promise of Carson’s book: to let the public decide for themselves. Of course, I am not claiming that Carson’s use of uncertainty is the cause behind the success of “Silent Spring.” But if you take the same strategy and follow the reception of uncertainty through the media, such as the CBS broadcast on “Silent Spring,” and in the President’s Science Advisory Committee policy documents, in Carson’s testimony before Congress, and in the E.P.A.’s ban on DDT, you can witness the same strategy to assert ignorance and risk, and use visceral images to transform scientific uncertainty into a political certainty. One of the primary lessons 50 years after the publication of “Silent Spring” is that expressing uncertainty is not just a skeptic’s position. Uncertainty is a way to manage scientific ethos and provide grounds for the public to participate in scientific controversies. Strategically managing uncertainty offers scientists a way to appear trustworthy, protect against bias, and assert their practical wisdom, moral virtue, and goodwill toward the audience. Scientists need to make it a habit to express uncertainty skillfully. They must do so in ways that provide an accurate assessment of choice in the face of our perpetual ignorance, and our inevitable uncertainties. This is an illuminating and important study of “Silent Spring” and how Rachel Carson understood and deployed scientific uncertainty in making her arguments in the book…which turns 50 on this very day. And the conclusions reached by these authors make sense in light of Carson’s approach. A relentless reviser, Carson also depended in all of her books on a vast network of experts, scientists, scholars, and physicians who reviewed and commented on her work in progress. Carson listened to these reviewers. This was particularly true in the section of “Silent Spring” dealing with cancer, which Carson re-wrote several times, in the process moderated her claims of a link between pesticides and the disease in part on the advice of her own oncologist (Carson was being treated for the breast cancer that eventually ended her life at 56). I also think the authors of this study offer wise advice to those of us writing today about issues like climate change: Rather than cede the useful concept of uncertainty to those who would deny scientific consensus, we’d do better to embrace and explore uncertainty for what it is…a valuable and inevitable part of scientific discovery. One more thing that makes this study of Carson’s approach so fascinating is that I think you have to try to imagine the context Carson was working in in the late 1950s/early 1960s. The idea of chemicals contaminating what Carson called “the total environment” was novel at the time. And it was her recognition of an exact parallel with the steady rain of fallout from nuclear testing that helped her explain what we knew…and didn’t know…about the consequences and potential collateral damage from heedless tampering with global ecosystems. It’s no accident that Baby Boomers became the vanguard of the environmental movement. They grew up drilling for Armageddon (“Duck and Cover”), and when they read Silent Spring they GOT IT.